Prepare oats according to package instructions. Set aside. In a large frying pan over a medium flame, add olive oil and allow it to get hot. Add halved tomatoes and salt and pepper to your taste. Cook tomatoes for 7 minutes on each side. Remove from flame. 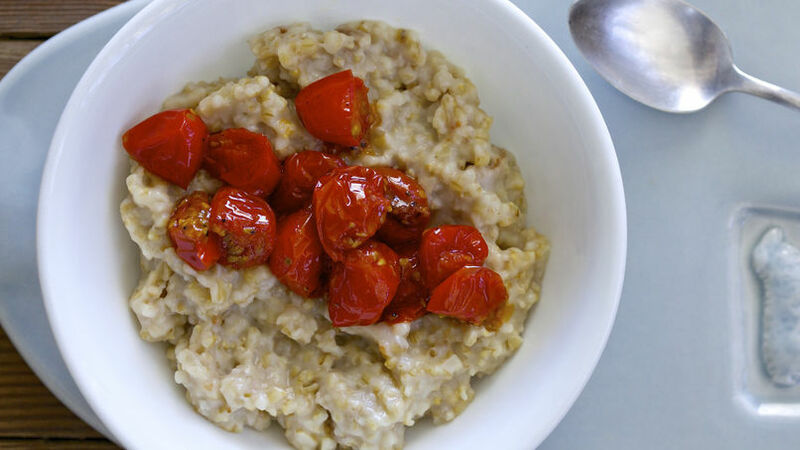 Serve oatmeal in a bowl and top with blistered tomatoes. Enjoy! You can use any type of steamed, raw, or roasted vegetable in this dish. Most of us associate oats with sweet toppings like cherries, brown sugar, candied pecans, apples or raisins, among others. But the truth is there are so many other great savory accompaniments that you wouldn’t imagine! I like to eat nutritional food pretty often; hence this amazing and lively oatmeal recipe which is sugar-free. The reason I chose tomatoes for this recipe is because that’s what I happen to have available in my fridge. I mean, I really like tomatoes but I could have gone with any number of veggies. That’s the great thing about savory oatmeal: anything goes great! Be open and give it a try!